When "catfish of the month" time comes around I appear to have an almost unlimited supply of reasons to choose one species or another. It's about the only part of the site that I have great fun in choosing what to do next - my little "play God" moment! The selection is driven by such forces as what has been appearing in importers and shops recently, what (and this is often linked) I've been getting the most mail about or, not quite so often, what individuals have requested that I write up next. This month is different; this month I'm writing about one of my "top 10" catfish. A personal favourite and one long on the "must have" list, it is only in the last couple of years that I have seen, kept and learned about this particular species. By happy coincidence this fish has also been quite a talking point and subject of request recently. There have been major advances in the total knowledge of this species over the last few years and I hope to pass them on. Lake Tanganyika exists in east central Africa, in the Great Rift Valley, bordered on the north by Burundi, on the east by Tanzania, on the south by Zambia, and on the west by the Democratic Republic of the Congo (DRC, formerly Zaire). The lake is 680 km (420 mi) long and about 72 km (about 45 mi) wide at the widest point and covers about 32,900 sq km (about 12,700 sq mi). The greatest depth is 1,436 m (4,710 ft), making it the second deepest freshwater lake in the world (Lake Biakal in Siberia is the deepest - what catfish live there?). The only outlet from Lake Tanganyika is the Lukuga River, which flows into the Congo River. The lake is noted for its many varieties of fish; crocodiles and hippopotamuses are found on the shores, and the surrounding area is very fertile. The lake was first seen by Europeans in 1858, when the British explorers John Speke and Sir Richard Burton arrived there. Lake Tanganyika is renowned for its beautiful and unusual cichlids, but it has catfish all of its own too. Amongst these catfish are some of the most attractive, rare, interesting and expensive of all catfish in the aquarium hobby today. For a long time, Synodontis lucipinnis was known to be different from the similiar Synodontis petricola primarily as it was smaller in adulthood - hence the "working title" Synodontis sp. cf. petricola `dwarf`. Intriguingly, it is similar to other described catfish from the lake. The cuckoo catfish, Synodontis multipunctatus, is the most common import and you, occasionally, may also encounter S. polliem>, S. dhonti and S. tanganaicae. All sport the distinctive white barbels and are spotted as juveniles to some degree or other and thus another form of quick identification prevails - S. petricola and S. lucipinnis are the only species with a solid white leading dorsal and pectoral fin ray and the spotted body pattern. The number of spots can vary: the images above show a darker, more spotted 4" (SL) adult (above) and lighter, lesser spotted 1" / 2.5cm (SL) youngster (below). Although it is a dwarf form, S. lucipinnis has all the visual characteristics of S. petricola except, crucially when looking at younger fish, shows a light patch of colouration in the rayed fins. When writing about the genus Synodontis I find it hard not to draw parallels with the South American genus Corydoras. At the time of writing these two genera make up nearly 60% of images in our image library (think about it - that doesn't include ANY plecos / L-numbers). Amongst these fish are some of the most commonly available, rare, collectable or overlooked catfishes found for sale worldwide. 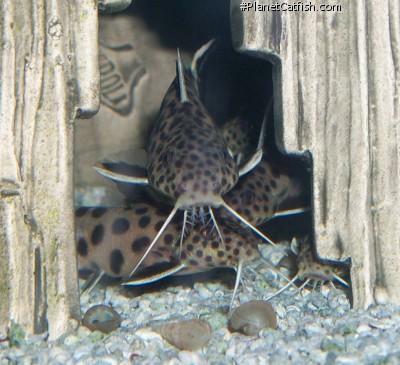 The genus Synodontis is second only to Corydoras in terms of the number of species that find their way into hobbyist tanks. The major difference between the two (from an aquarist's point of view) is social behaviour and in particular, reproduction. Only a minuscule number of Synodontis species have reproduced in the confines of five glass panels, while the prolific abilities of most Corys is well known. To the left is a diagram of what we are trying to achieve. I can't take credit for the idea and I am not sure who "invented" it. Purchase a four to six inch clay flowerpot along with its base, the base can also be a similar sized plastic flowerpot. 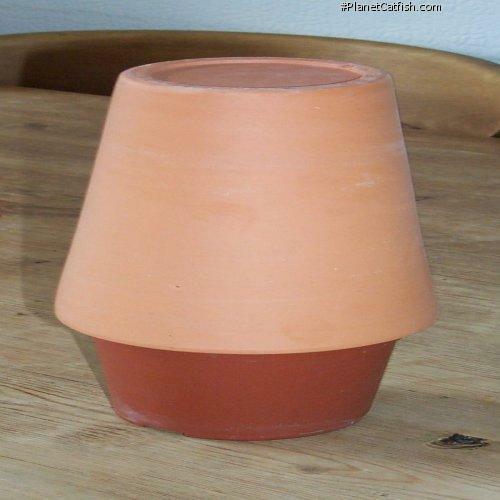 Break out a portion of the lip of the larger, ceramic flowerpot large enough to form a cave entrance for the fish. In the side of the base cut or drill a hole just the right diameter for a sponge filter with out the sponge attached. Place the sponge filter through the hole and fill the base with the marbles. If the base is plastic this will also stop the base floating away. Now place the actual flowerpot upside down on the base to form a cave. 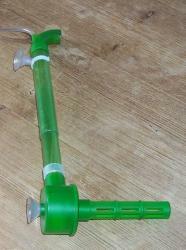 Attach the sponge filter to the side or back of the tank. Now, you will need something to catch the eggs in as they spew forth from the sponge filter. One breeder uses a clear acrylic specimen container. Coming out of this is a "U" return tube. The tube needs to be covered with something so that the eggs are not sucked back into the tank. There are many of different ways to do this part. Use some creativity. 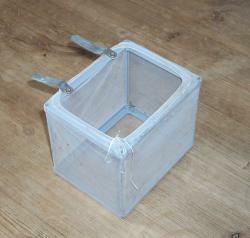 I think that a mesh box used for breeding live-bearers works best if the mesh is very fine. 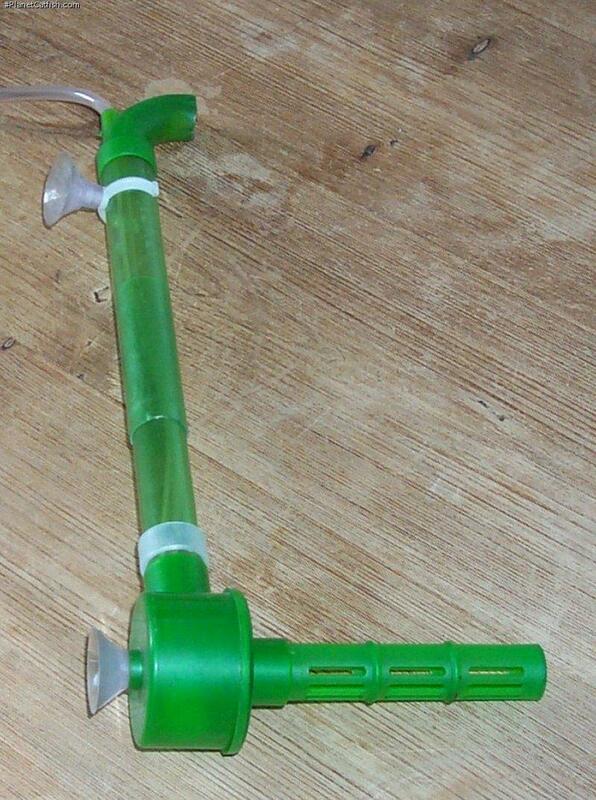 You could construct this yourself with material and drinking straws. Now what happens? Often but not always at night the fish will enter the cave and lay eggs. 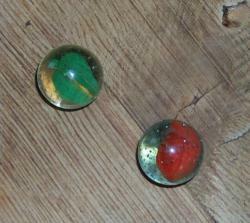 The eggs are quickly sucked through the marbles before they are eaten. They go up the sponge filter and are deposited in the "egg catcher". Keep the egg catcher on the front of the aquarium and it is not even necessary to molest the fish to see if they have spawned. This technique works very well and people have reported spawning within days of setting the system up. This tells me that it is likely that the fish were spawning all along and eating the eggs. This technique should be tried with fishes other than mochokids. I believe that it has good potential for some bagrids, doradids, pimelodids, sisorids, and auchenipterids. The system is certainly inexpensive and easy enough to set up that it would be worth trying. It could be modified in many different ways and used in conjunction with other spawning triggers (e.g. cool water changes, soft water additions, black water extracts, increased aeration, etc.). Good luck and we would all be very interested in learning about your triumphs and failures with this system. Build it and they will spawn.